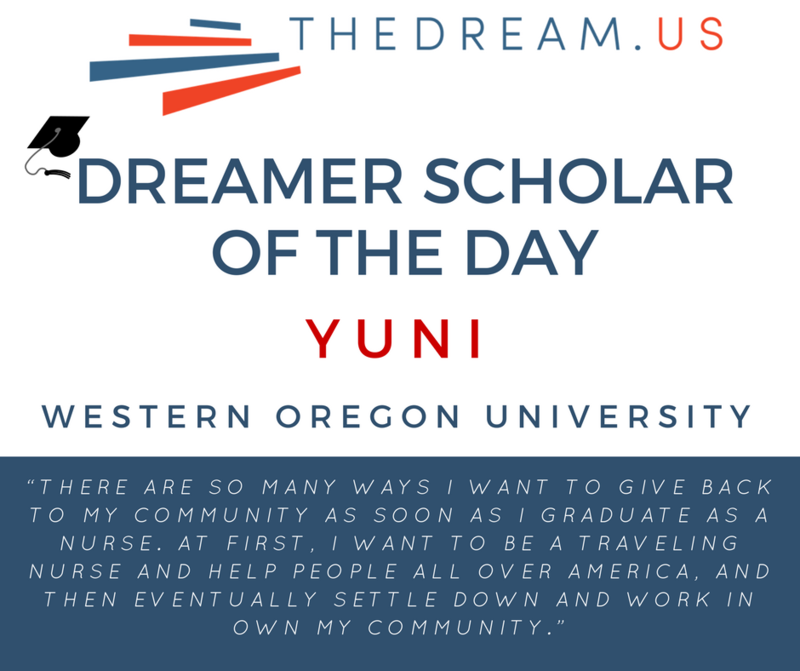 Yuni, 19, from Oregon, born in Mexico. There are so many ways I want to give back to my community as soon as I graduate as a nurse. At first, I want to be a traveling nurse and help people all over America, and then eventually settle down and work in own my community. And then one day, if possible, I would like to go on a mission trip to my birth country and help people in my hometown. Not only would I be helping them but I would also be able to learn about my roots.I am one-fifth of a mixed status family: My dad and mom don’t have legal status; I am a DACA-recipient; and my 15-year-old brother and 12-year-old sister are American citizens. I am the first in my family to go on to college, with the support and encouragement of both of my parents. When we first arrived in the United States, we stayed in a trailer park with my dad’s brother in Idaho. My dad was determined to give my mother and I a better life. Eventually he got the idea to build a taco truck, and it was up to me to learn all the materials that he needed to purchase. I remember telling him: “Dad, I don’t know what this is!” and “This is too hard for me to understand!” And all he said in response was, “I’m sorry mija but I need you to learn this,” Now that I am older I’m grateful. Those situations taught me invaluable knowledge. My dad works as a milker at a dairy. He only stayed in school through second grade back in Mexico, because his parents wanted him to work instead. My mother still owns the taco stand that my father built for her. She has been running the stand for almost 14 years now. Although she struggles with her health, every day she wakes up with a smile ready for work. I admire her greatly. As I got older, I started seeing how hard my parents worked and valuing their dedication. They came home really late from work, but they came home safe and sound in a city that we knew to be home. I know back in my birth country I wouldn’t have grown up the way I’ve grown up here. And I’m just very thankful to be here. I live in a Hispanic, rural, community. I love it because we all know one another, but I have also been able to travel to different parts of the U.S as an young adult representative to different conferences within the United Methodist church. My job was to be the voice for the youth within the United Methodist Church.I began to view America as home the moment I started school. I was a part of the community. Over the years I have been involved in cheerleading, volleyball, track, academic decathlon, and I was the president of the youth group in my church. America has helped me become who I am today and, by the love of God, I’ve been able to fulfill so many of my dreams here. Higher education for DREAMers is critical because our voices need to be heard. We have so much to give and we can contribute so much more to this country. I want my fellow DREAMers to never be scared and to apply for these scholarships. Anything is possible, all you need is a vision and a lot of faith.